Here's another picture of me when I was a kid. 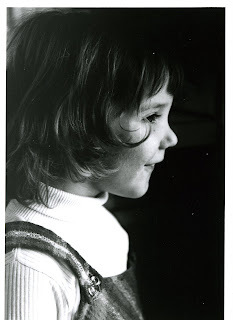 I think that I was 4 years old when it was taken. Well, we go up to South Bend to pick up my cousin Kelcie who will be in town for a few days (she's in a friend's wedding this weekend). Her sister Lindsy, who just moved out of our house, is now in Costa Rica (and then will be going to Nicaragua for the remainder of the summer). So at least Kelcie got to leave Kansas, where she now lives, for the excitment of Indiana! Well, I just made an appointment to donate blood tomorrow. We'll see how it goes -- the last 2 or 3 times I tried to donate I was rejected because of low iron. I've been eating more fish lately, and taking multi-vitamen supplements when I remember, so hopefully I'll qualify this time. My lovely orchid I've had on my desk at work for the last couple of months is finally losing its flowers. Only one lonely bloom is left. Ah, well. Hopefully it will bloom again in a year or two if I keep watering it, like others of our orchids have done.